No driver should drive without having a dedicated plan for what to do when glass damage impairs the ability to drive. The average driver focuses more on automotive repairs, but forgets to realize that driving with window damage is against the law. PG Studio City auto glass repair specialists provide the plan you need to have for your automotive window repairs and replacements. Accidents and collisions never happen in a convenient area and getting help when you need it can be frustrating. Broken glass from your car or truck can also be a hazard to innocent drivers. The fast arrival for auto glass repair in Studio City cannot be underestimated. PG Auto Glass sends out experienced experts to survey your damage and provide the repair that you need. Severe weather complicates driving conditions and increases the chance of sliding or out of control vehicles on the road. Unexpected barrages of hailstones or falling debris can easily break your car windows. PG Studio City auto glass repair offers 24/7 services and treats every call as an emergency. All work is guaranteed for the life of your repaired or replaced auto glass. The daily drive to work is one of the biggest contributors to automobile wrecks. The morning rush for every driver to get to a destination in the shortest amount of time possible increases possibilities for glass damage. 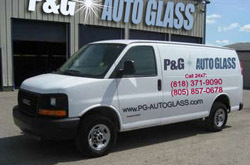 PG auto glass repair in Studio City responds with mobile response vehicles and comes straight to stranded motorists that need immediate help getting back on the highway after glass damage happens. Fixing a crack or break is one thing and actual auto glass replacement in Studio City is another. No driver can predict when total breakage will occur and problems can happen at night making the situation much worse. PG Studio City auto glass replacement specialists are on call seven days a week to provide superior service when drivers need it the most. Expertly trained technicians know how to work quickly without making errors to provide a manufacturer rated replacement. Do you need a service for auto glass repairs and replacements in Studio City, CA in zip codes 91604 and 91614? Contact PG Auto Glass for 24/7 services.